Panels are hoisted toward installation in one of three broadcast arrays above the new 1 WTC. Local New York City TV stations expect the new central TV broadcast antenna spire crowning 1 WTC to be the pinnacle of a dynamic future. 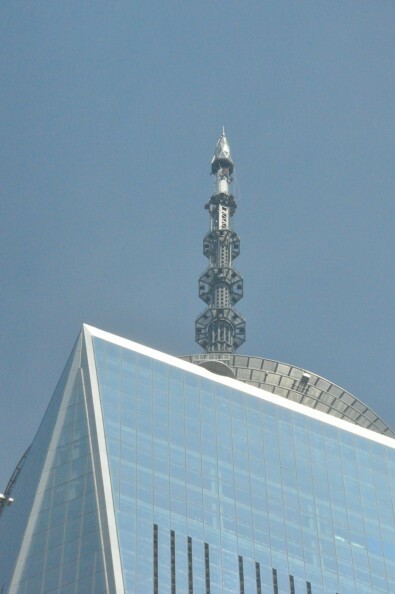 When the original One World Trade Center TV antenna was installed in 1978, it became home for most full-power New York City TV station transmitters and reminded so until 9/11/2001. From the first moments following that infamous event, those stations who lost their WTC transmitters focused on getting back on the air. When stations returned to air one by one, the locations of transmitters and broadcast antennas were scattered about the local market. There was a hunger for a new World Trade Center topped by a new central TV broadcast antenna system. Shared antenna discussions were already underway when the new 1 WTC (Freedom Tower) foundation cement was being poured in 2006. After years of discussion and planning among a number of organizations, The Durst Organization (TDO) partnered with the Port Authority of New York and New Jersey in 2010 to lease the rights to manage the 1 WTC spire and roof for broadcast and telecommunications purposes. TDO is one of the oldest family-run commercial and residential real estate companies in New York City. Figure 1. Three panel array antennas form the 1 WTC spire. Click to enlarge. Within months after 9/11, engineer John Lyons was hired by TDO to manage a rooftop antenna rebuilding project at 4 Times Square (4TS), a TDO-owned 809-foot skyscraper, the 12th tallest in NYC. The project involved replacing a 132’ FM tower with a 385’ tower built specifically for primary or backup for all NYC TV and FM stations. A new tower was installed in October 2003, and three weeks later WABC was broadcasting from it. The tower was reworked in 2015 with the dismantling of the WFUT antenna and the placing of the WJLP antenna atop the working antenna tower. The tower is now 416’ tall. By 2015, 1 WTC was completed and, as Director of Broadcast Communications at TDO, engineer John Lyons was ready to explore the uncharted territory atop New York's now tallest skyscraper. The building has a height of 1776’, about 400’ higher than the original World Trade Center. The radio horizon at 1776’ is 60 miles. Lyons and his group first needed to design a VHF and UHF antenna test for such real world conditions. A test antenna contract was awarded to New Jersey’s Myat, and a test antenna was built for the project by Radio Frequency Systems (RFS). In spring 2015, the antenna was installed and TV signal measurements were taken at 200 test points as the broadcast antenna was horizontally swiveled + 15 degrees to confirm the radiation pattern and null fill. Tests also verified that a 1 degree beam tilt would provide optimum coverage within licensed contours. Scientific testing verified that critical contour patterns could be sustained, and by the end of the year four TV stations had signed license agreements for the new 1 WTC location. Many factors were included in the 1 WTC antenna design and transmission line selection. TDO wanted a minimum capacity for 4 VHF and 10 UHF channels. Stations wanted an optimum signal pattern that goes “down and out”. In other words, an omnidirectional horizontal radiation pattern with robust coverage below for over-the-air viewers in Manhattan. “We are feeding 13.8kV to the broadcast floor and converting to 480V at that location. This allowed for a better more compact highly efficient system, less lossy than running 480Vac up the building,” said John Lyons. 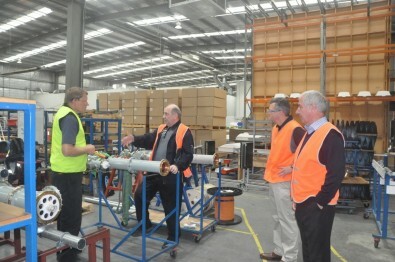 RFS technicians and John Lyons (center) inspect transmission line in the RFS factory. Future technology was factored into the 1 WTC antenna design. All hardware had to be ATSC 3.0 ready. This meant the antenna systems needed the ability to operate on both existing and post-repack channels. TDO also wanted the option for stations to add vertical polarization to their signal, and the ability for stations to independently change their polarization ratios with minimum interruption. For the best-possible close-in coverage combined with good power handling capacity, the UHF antennas have a vertical aperture of 16 wavelengths. Aperture illumination was designed to produce optimum beam tilt while meeting unique null-fill requirements. Permanent RFS antennas for the 1 WTC spire were ordered through Myat. All are multi-panel arrays. One is a 40-panel PEP-40 UHF antenna, using 5 panels around x 8 high. The second antenna is a 16-panel 662-16D CP VHF, with 4 panels around x 4 high. 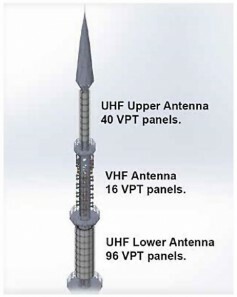 A third UHF antenna is a PEP-96 UHF totaling 96-panels, with 12 panels around x 8 high. Both UHF antennas use the same type of panel. When joined together in an array, the curve of the panel casings form a smooth round wind load. The PEP-96 antenna arrived on-site two months after the PEP-40 and the 662-16D antennas were delivered. 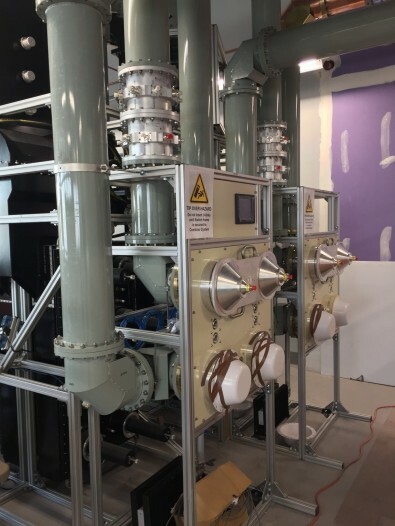 The UHF combiners were also manufactured and tested in December 2016 and February 2017 and then delivered. The PEP-40 antenna is set just under the beacon section of the spire with the 662-16D under it, and the PEP-96 in the next section down from the top, as shown in Figure 1. Each antenna system was factory-tested to confirm its designed radiation patterns and axial ratios. It was done with by mounting ¼ of the antenna on a full-scale replica of a tower cross section. Testing at RFS far-field test ranges verified that the radiation patterns and ratios matched specifications. 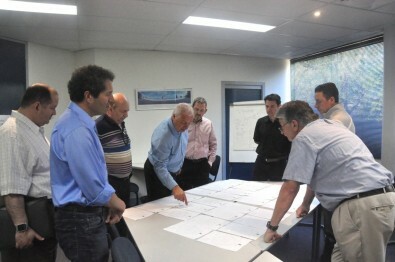 The TDO team reviews the test plots of the PEP-40 antenna at the RFS test range. Both UHF antennas allow stations to independently upgrade to Multiple In, Multiple Out (MIMO) or Multiple In, Single Out (MISO) operation. Those technologies are defined in ATSC 3.0 as a method to allow different antenna polarizations to transmit different data streams on the same channel. Both UHF antennas achieve variable polarization with two separate inputs, fed from two separate channel combiners. With TPO split between the two half-antennas, the relative phase of the input signals determines the polarization ratio. The dual and quad antenna feeds required meticulous phase-matching. All but one of the TV stations moving to 1 WTC plan to use 50/50 H/V polarization. One of the challenges designing the transmission line systems was the 10’ freight elevator height restriction. Most RF installations use 20’ sections of line. The shorter 10’ sections result in twice as many flange joints requiring compensation. The physical runs use existing risers and hallways thus requiring an unusually large number of elbows. Computer analysis determined the best line-length sequencing to achieve the lowest in-band VSWR and the physical run also was optimized to minimize the number of elbows. The path of the transmission lines is the one with the fewest elbows. The 1 WTC construction project was completed before any broadcast transmission facilities were installed. That fact, and the 10’ height limitation turned out to be a bit of a blessing in disguise. Randomizing the lengths of transmission line sections minimized VSWR resonance spikes and spread the reflections over the entire band. In many instances, line lengths were cut-to-fit and elbows inserted where the physical installation demanded, further randomizing reflections. The top-mount PEP-40 is fed post-combiner TPO with dual 7 3/16-in, 75 ohm transmission lines. The larger PEP-96 at the base of the mast is fed with dual 8 3/16-in, 75 ohm transmission lines. The VHF antenna in the middle is fed with four 4 1/16-in 50 ohm lines. All lines and antennas can handle higher ATSC 3.0 peak-to-average power ratios. 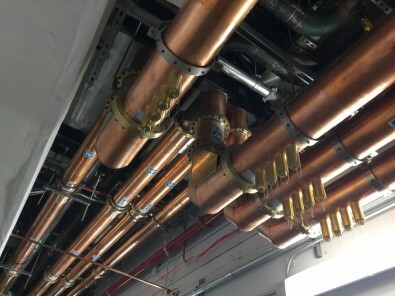 The liquid-cooled UHF combiner switchframe as installed at 1 WTC. As if working above 1600’ wasn’t difficult enough, designing the hardware to move through the existing building had to be well coordinated. Not only did feed line need to be pre-cut to fit the freight elevators and passageways, but the antennas had to be custom-built and shipped in pre-assembled modules. Each shipped module was 6 panels with power splitters and distribution cables, sized to fit the elevator. High efficiency, fully tunable, broadband waveguide combiner modules were installed in anticipation of repack. The combiners are liquid cooled to reduce building heat load. At the request of broadcasters committed to 1 WTC, the combiner modules include internal mask filtering. The stations opted for 8-pole filter responses over 6-pole filters in anticipation of ATSC 3.0. In the meantime, John Lyons has already identified a plan for repack, which is a little easier when you have dual everything. The plan is to move the UHF stations over to one antenna, then retune the other antenna, combiner and filters for stations' new repack channels. The benefit is that when all stations change over at one time, viewers only have to rescan their TVs once to find them. At publication time, WNJU is scheduled to begin broadcasting from 1 WTC in Spring 2017. Stations WNBC, WCBS and WNET are scheduled to follow later in 2017 and 2018. A whitepaper on the project, “Building the advanced customizable RF transmission system at One World Trade Center,” will be presented at the 2017 NAB Show on Sunday, 23 April at 2 p.m. in meeting room N258. The author thanks John Lyons for his assistance and expertise. All photos courtesy John Lyons.